His Holiness Aram I was born in Beirut, Lebanon in 1947. He studied at the Armenian Theological Seminary in Antelias, the Near East School of Theology in Lebanon, the American University of Beirut, the Ecumenical Institute of Bossey in Switzerland and at Fordham \University in New York. His major areas of specialization are philosophy, systematic theology and Near Eastern Church history. He holds an M. Div., an S.T.M., a Ph.D. and several honorary degrees. Catholicos Aram I was ordained as a celibate priest in 1968. Two years later he obtained the title of Vartabed, or Doctor of the Armenian Church. Late in 1978, while studying at Fordham University, he was elected Locum Tenens for the Diocese of Lebanon and a year later became the Primate of Lebanon. In 1980 he received an Episcopal ordination. 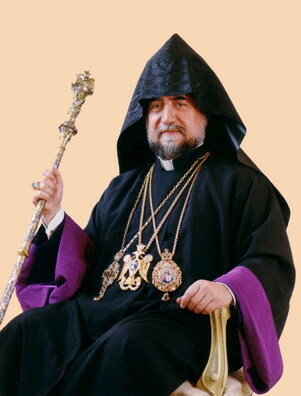 Called to serve as the Primate of the Armenian Diocese of Lebanon at a critical period in Lebanon’s history, His Holiness has made the following priorities the basic objectives of his pastoral work: reorganizing parishes and schools, reactivating social and church organizations, renewing community leadership and encouraging dialogue between the Christian and Muslim communities. From 1972 to 1995, Catholicos Aram I served as the General Secretary for the Ecumenical Relations of the Catholicosate of Cilicia. In this position, he represented the Catholicosate at major ecumenical conferences and assemblies in different parts of the world. His Holiness, in 1974, was one of the founding members of the Middle East Council of Churches (MECC). From the creation of the MECC he has served on the Council’s Executive Committee. As delegate of his Church, he attended the Nairobi (1975), Vancouver (1983), Canberra (1991) and Harare (1998) Assemblies of the World Council of Churches (WCC). In 1975, His Holiness was elected as a member of the Faith and 0rder Commission of the WCC and in 1983 as a member of the Standing Committee of the same Commission. At the Vancouver Assembly, His Holiness was elected as a member of the Central Committee of the WCC. Later, at the Canberra Assembly, he was elected as Moderator of the Central and Executive Committees of this global and prestigious fellowship of churches. The WCC includes in its membership more than 350 churches from different confessions, cultures, nations and regions. His Holiness is the first 0rthodox and the youngest person to be elevated to such an important position in the WCC. After serving a seven-year term as Moderator of the WCC, His Holiness was unanimously reelected at the Harare Assembly in December of 1998 for a new seven-year term. The reelection of His Holiness, which was based on his strong leadership, firm commitment, theological knowledge and administrative experience, is unprecedented in the history of the WCC. His Holiness completed his tenure as Moderator of the WCC in 2006 at the General Assembly in Porto Alegre, Brazil. Besides his important responsibilities in the WCC, Catholicos Aram I has also been a founding or active member of several international committees and organizations, such as: an honorary member of Pro 0riente, a Roman Catholic ecumenical foundation based in Vienna, as well as a member of its Standing Committee; a founding member of 0riental 0rthodox-Eastern 0rthodox Theological Dialogue; 0riental 0rthodox-Reformed Dialogue; 0rthodox ¬Evangelical Dialogue; and an honorary president of the international organizations “World Religion’s Museum” Foundation and World Religions for Peace; a member of International Committee for the Protection of Religious Sites. His Holiness has been instrumental in creating the Standing Committee of the Three Heads of the 0riental 0rthodox Churches in the Middle East (Coptic, Syrian, Armenian) and has played a pivotal role in initiating major theological dialogues and ecumenical encounters. Since 2005, His Holiness has played an instrumental role in re-organizing the Christian-Muslim Committee of the MECC, and in preparing the International Inter-Religious Conference organized by the WCC. In November of 2007, His Holiness was elected as President of the Middle East Council of Churches. Furthermore, He has brought significant contributions as a key note speaker and Moderator to the G8 Inter-Religious Summits. In the last several years His Holiness has played a significant role in promoting inter-faith dialogue among Christians and Muslims. He has chaired and lectured at Christian-Muslim international conferences in Beirut, Geneva, Brussels and in London. 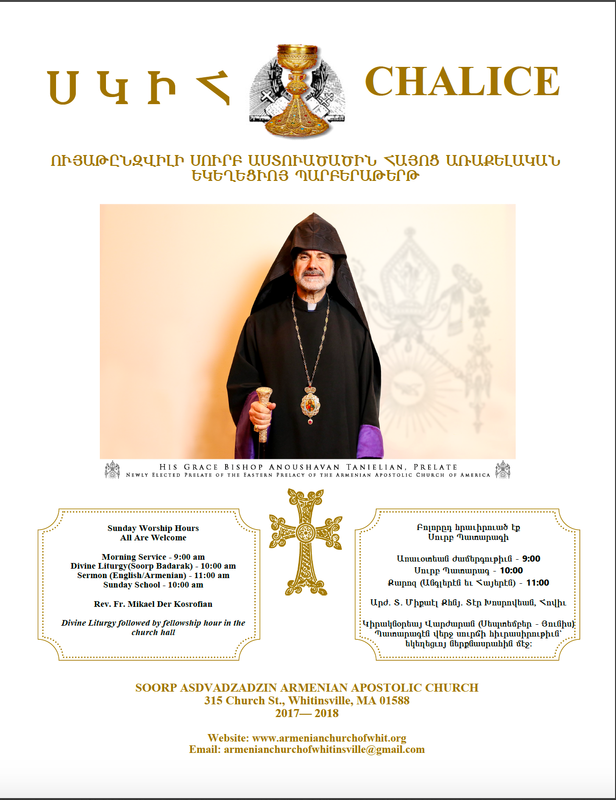 0n several occasions, His Holiness Aram I has given public lectures on Armenian, ecumenical and theological themes in various countries and in international circles. His CV appears in the Who’s Who in the World, in the International Directory of Distinguished Leaders and in many international directories and publications. He has reorganized and revitalized the work of the Armenian Catholicosate of Cilicia, particularly in the following domains: the Theological Seminary, the Department of Christian Education, the Department of Publications, the Department for Ecumenical Relations, the Department of Communications the Department of Youth, the construction of the ‘Cilicia’ Museum, the development of the church’s’ cultural and social activities. He has brought a new dynamism into the Catholicosate-Dioceses relationship as well as into the internal life of each diocese by establishing a new and more positive working style. He has paid pontifical visits to all the Dioceses of the Catholicosate in the Middle East, Europe, North America and South America. He has paid particular attention to the ecumenical relations of the Catholicosate by establishing a special department for ecumenical and inter-religious relations. He has encouraged clergy and laity to take part in the ecumenical movement, establishing close personal relations with world church leaders, hosting many church leaders and holding important ecumenical meetings. In the area of infrastructure, His Holiness has realized a number of projects: construction of new buildings for bishops and monks; construction of a guesthouse and new offices; construction of a new section in the Catholicosate for archival materials, and renovation of the Seminary and the Catholicosate headquarters. In the context of international relations, His Holiness has met a number of heads of states, political leaders and representatives of international organizations. With his vision and commitment, His Holiness Aram I has made the Catholicosate of Cilicia a living center of reflection, action and dialogue. THE ARMENIAN CATHOLICOSATE OF CILICIA The spiritual heritage of the Armenian Church and the historical memory of the Armenian Catholicosate of Cilicia have shaped the mission of the Catholicosate, which today embraces various dimensions and spheres of the life of the Armenian people. THE ARMENIAN DIASPORA Throughout its history, and especially in difficult times, the Catholicosate has been actively present in the religious, educational, cultural and social life of the Armenian people. After the 1915 Genocide, it contributed crucially to the formation and organization of the Armenian Diaspora. THEOLOGICAL FORMATION The Theological Seminary has played a pivotal role in the witness of the Catholicosate. Many teachers, married priests, monks, bishops and catholicoi have graduated from the Seminary and have served the Armenian Church and nation in an exemplary spirit of Christian dedication and witness. DIAKONIA/SOCIAL SERVICES The Catholicosate has contributed significantly to the development of social services. It has not only encouraged social projects at the diocesan level, it has also initiated important social projects, mainly in Lebanon, Syria and Greece. It directly administered the Birds’ Nest 0rphanage in Jbeil, the Sanatorium, the popular housing project and the homes for elderly in Lebanon, Syria and Greece. CULTURAL LIFE The Catholicosate promotes Armenian spiritual and cultural values as witnessed by its recent construction of a Museum and by its well-stocked Library. Its publishing house, which produces numerous titles every year, has established many important book fairs, conferences, seminars, cultural gatherings and concerts. ECUMENICAL RELATIONS Since 1950′s ecumenism has been a major concern of the work of the Catholicosate. Its lay and clergy representatives participate actively in the meetings and conferences of the World Council of Churches (WCC).The ecumenical engagement of the Catholicosate was given a more organized form after 1962, when it became a member of this world family of churches. During the General Assembly in Nairobi, in 1975, Bishop Karekin Sarkissian (the late Catholicos of Etchmiadzin) was elected as a Vice-Moderator of the Central Committee (a position he held until 1983). At the 7th General Assembly in Canberra, in 1991, Archbishop Aram Keshishian (His Holiness Aram I), became the first 0rthodox, the first Middle Easterner and the youngest person ever to be elected Moderator of the Central and Executive Committees. His Holiness was re-elected at the 8th Assembly of the World Council of Churches in Harare, Zimbabwe, in 1998, and served in this capacity for an unprecedented 15 years until 2006. THE ARMENIAN CAUSE Itself a victim of the Armenian Genocide, the Catholicosate was a key player in bringing the Armenian Cause to the attention of the world at large. It also worked to build its own people’s awareness of the Genocide. THE MIDDLE EASTERN CONTEXT Having its headquarters in the Arab world, the Catholicosate has participated fully in the major events of this region. It has taken part in the struggle for independence of the Arab countries, mainly in Lebanon and Syria. It has strongly supported a just, comprehensive and permanent solution of the Arab-Israeli conflict. Being a firm believer and defender of co-existence and dialogue, the Catholicosate has taken part in all efforts aimed at creating and strengthening a shared and harmonious common life among religions, societies, cultures and civilizations in the Middle East.